How many email accounts I get per user account? What does extra "email account" & "user account" mean? User will get 1 email account per 1 user account for free. To add more email addresses as sending method one needs to buy additional email account. You can buy as many email accounts you need to. What is the pricing for additional Email Accounts? The pricing of addition email account will be same as the pricing of primary user account. For example: If user has subscribed to PLUS MONTHLY PLAN (Ex. $20) for the primary user account (The initial signup email address), the additional amount for each additional email account ($20) will be same as the primary account subscription. How to buy additional Email Accounts? You will see the button (on the right side, in third section) "Add Email Account Seat", hit the same and you will get the prompt message as below. For the above screenshot, primary user account has the active subscription of "Enterprise Plan" and he has next billing date as 3rd day of next month. Consider today is 8th day of current month. Hence, the payable amount comes to $41.94 after pro rata based calculation. Note: If you have signed up using "Signing with Google" button, the email address from which you have signed up will be your default sending method as well as default email account for that particular user account. Which can not be changed later on. If you want to change or add more email account as sending method you need to buy additional email account on SalesHandy. For the existing user who have signed up on SalesHandy before the release of version 2.0, they will see the same number of email accounts they have connected in SalesHandy Version 1.0 in the latest version. 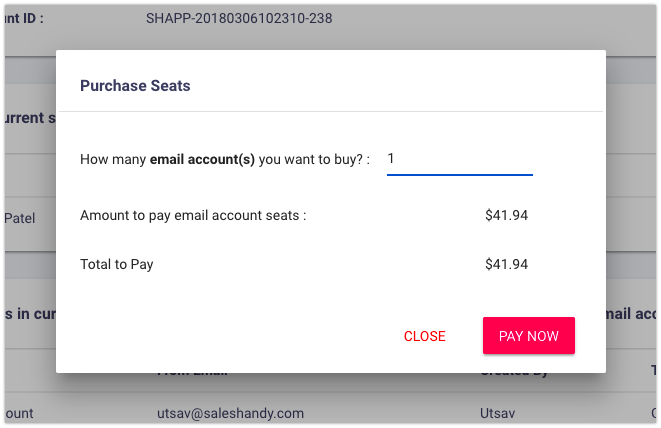 For example, if you have connected a google account using OAuth & another account using SMTP in version 1.0, you will see both as sending methods in SalesHandy Version 2.0 (for that you do not have to pay additional amount). Once any of the account is disconnected you won&apos;t be able to add the same for free. Feel free to reach out to support team in case of any queries. Simply hit the live chat icon on the right bottom corner on your screen.